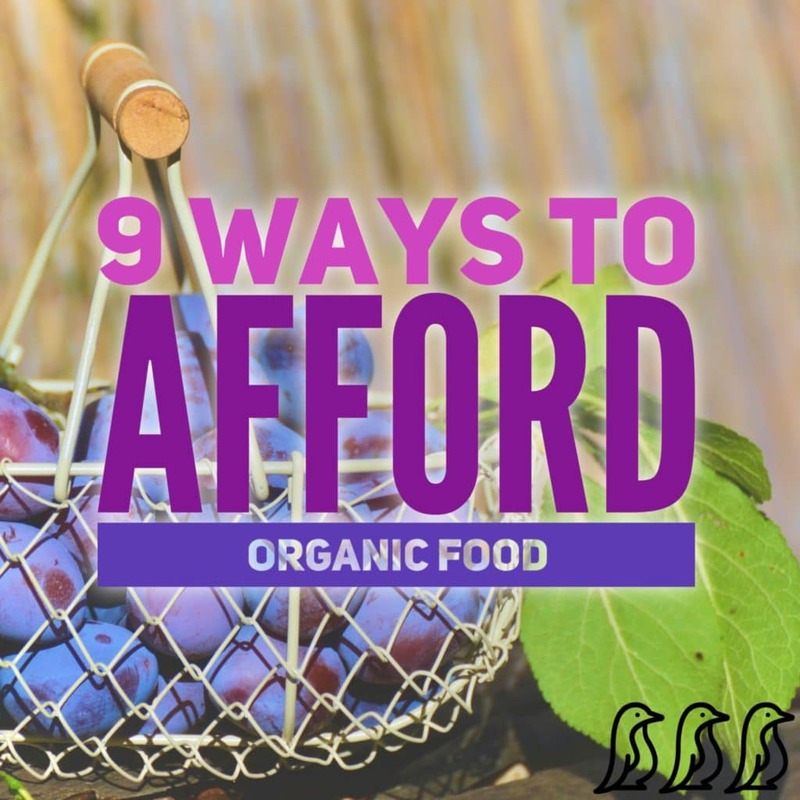 You want to eat healthier and buy more organic foods, but you’re worried about the cost. 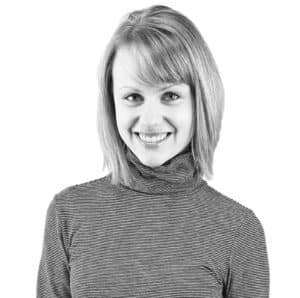 When we decided to eat real food as a one-income family with an already tight budget, it was hard to justify spending more money on healthier food (especially while trying to pay off tens of thousands of dollars in school loan debt!). But as we began making changes and choosing more high-quality foods—including many organics—we’ve been able to keep our grocery spending between $300-$350 each month for our family of 4. It’s not always easy, but realizing that it was actually possible for our family encouraged us to tell others that they can do the same! 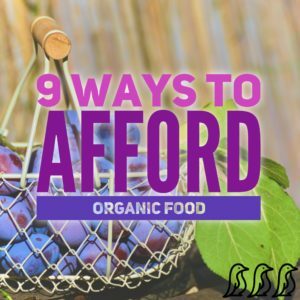 As long as our family is living off just one income, it will be a stretch to buy all organic food; however, we currently try to do the best we can to get the most for our money and health. Meat is expensive, especially organic meat, and we often assume it needs to take center stage in every meal. Instead, try stretching it further by serving meat topped on a salad, mixed into a soup or chili, or even serve a meatless meal once or twice each week. If you do want to eat more meat, consider buying less expensive cuts (ground beef vs. steak; whole chicken vs. boneless chicken breast). Tip: Get the most out of a whole organic chicken by making an easy and delicious Slow Cooker Rotisserie Chicken. Leftover shredded chicken is great to use in a variety of casseroles or as a pizza or salad topping. Save the bones and throw them back into the slow cooker for homemade broth! Purchasing meat in larger quantities cuts the price per pound and only requires a few minutes to separate into smaller amounts and freeze for later. I like to divide bulk raw meat into 1-pound portions and freeze in quart-sized freezer bags. Alternatively, I cook the bulk meat (plain or seasoned for tacos, etc.) and then divide it and freeze. Bag holders with clips are helpful to hold the freezer bags open for you! Check if your local farms offer the share of an animal, such as a quarter or half cow. If you have a deep freezer, this is an easy way to buy quality meat at a great rate and you’ll be stocked for nearly an entire year! Other companies, such as Zaycon Fresh, bring high-quality meat to a pickup location in your community at low prices. Currently, my area has chicken breast for $1.69/lb, ground turkey for $2.19/lb, etc.). Note: Zaycon meats are not certified organic, but they are high quality meats sourced from humanely raised animals and processed in the U.S.
3. Buy local and in season. Farmer’s markets and local farm stands usually have competitive prices on extremely fresh, in-season organic produce. Even if the produce they sell isn’t labeled or advertised as organic, talk to the farmer to learn about their farming practices. Small farms may not be able to afford the expensive process to become “certified organic,” but they may still utilize organic practices, at least use less pesticides than larger farms. If you don’t have many local options, choosing in-season fruits and veggies at the supermarket will still be your best bet. Organic fruits and vegetables from the freezer section are often less expensive than some fresh options, and are just as nutritious. Frozen produce is processed immediately during peak ripeness, unlike the “fresh” items in the produce section, which are often picked before ripened, shipped around the country, and then sit in the supermarket until they are purchased. 5. Cut out processed food. This may surprise you, but convenient packaged foods like snacks, drinks, energy bars and cereals are more expensive than eating “real” food from the source. Decreasing the amount of boxed, bagged, and pre-made foods you eat will free up extra cash you can use toward healthier options. To keep grab-and-go snacks available, try making a large batch of homemade granola bars, muffins, popcorn, or other family favorites. A CSA (Community Supported Agriculture) offers you a share of what a local farm grows each month. You’ll get fresh, local produce for a great price. Receiving a variety of vegetables and fruits may force you to try new foods and ways of cooking, which can be fun for the whole family. Visit a local farm to pick your own berries, apples, pumpkins, and more for an affordable price. Except winter, every season will have different seasonal favorites to try. It’s also an inexpensive and fun family activity! To make your savings last throughout the year, learn how to freeze fresh summer berries so you can enjoy the ripe flavor of fresh-picked fruit even after the peak season. Plant as much or as little as you want; even a small garden can reap large rewards. If you don’t have the space for a garden, try a few potted herbs and vegetables instead. Growing your own food means no pesticides and extremely fresh, convenient food a few steps away. ALDI: In recent years, ALDI stores have expanded the number of organic products they carry, and these items almost always cost less than everywhere else (even without coupons!). Our family’s staples include these organics: peanut butter, coconut oil, quinoa, brown rice, plain yogurt, whole wheat pasta, pasta sauce, salsa, tortilla chips, and fresh fruits and vegetables. We also like to buy these non-organic items: old-fashioned oats, unsweetened applesauce, trail mix, nuts, dried fruit, etc. Thrive Market: This online retailer offers natural and organic products at wholesale prices . Think Costco meets Whole Foods (with the convenience of Amazon!). You’ll find pantry staples, personal care and household products, vitamins, baby care, and more. There is an annual membership fee, but they also have a Saving Guarantee: If you don’t make your membership fee back in savings by the end of the year, they’ll automatically credit you the difference. Amazon: It’s hard to compete with the perks of Amazon Prime membership! There are certain items we love to buy on Amazon, especially Subscribe & Save items like toilet paper, diapers and wipes, dishwasher tabs, and even snacks. Eating more organic food will most likely be a gradual—not instant—change for your family. But don’t let the excuse that eating any organic food is out of reach. No matter your budget, it certainly IS possible! Find ways to start small and incorporate just a few organic foods into your weekly meals. By buying some organics, you’re “voting” with your money and creating more demand for those items over the conventional alternatives.